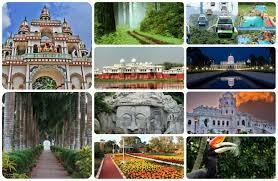 Tripura government has taken a number of initiatives to preserve and promote the cultural heritage of the state. AIR correspondent reports, the Director of Information & Cultural Affairs, Ms. Vishwasree.B said the culture aspect of Tripura has always been an integral part of Tripura Government to promote cultural heritage as well as positive outlook of the people. She informed about the various initiatives taken by the state government to promote and conserve state's cultural heritage. The Director also said that Tripura’s culture is mainly nature oriented and thus brings out a uniqueness of the state. While the fusion of Indian culture also seen in Tripura. People from across the country have settled here. Mr. Sudhir Anand from Bihar has been working for the last six years as Sr. Geologist. He is very impressed with the state’s rich culture. Tripura Society and Culture represents a fine blend of traditional and contemporary styles. It is also a manifestation of the admixture of age-old traditions, customs and beliefs of people of varied cult.